The quality of preservation is amazing. What are lobopods? They are an early group of anomalous animals that bear a certain resemblance to the living onycophorans (“velvet worms”), once thought to be a “missing link” between annelid worms and arthropods. Lobopods have often been seen as a stem group of modern arthopods: a stem group is an extinct group that is more closely related to the common ancestor of a diverse modern group than to the ancestor of any other group, but is not itself part of the first group. Irrespective of its exact position, Diania, with its stout and spiny limbs attached to a slender, vermiform body, remains a highly unusual creature. It is hard to envisage it as the progenitor of any modern arthropod group, yet it may derive from a grade of lobopodian that acquired a key evolutionary innovation—and the name-giving character for Arthropoda—whereby sclerotized, jointed appendages began to fully develop. The second beast is a fossil cricket Schizodactylus groeningae, whose description was published by Sam Heads and Léa Leuzingers in a fairly obscure journal, ZooKeys (reference below, access free). The description was based on two specimens from the remarkable Crato Formation of Brazil, dating back about 112 million years. The formation is amazing because it preserved many delicate creatures, especially insects. You can see the veins of their wings, and sometimes even their colors! Here are a couple of non-crickets from Crato. The authors conclude that the fossil cricket shares so many features with the modern ones in this genus, including coiled wings and those “sandshoes,” that it should be placed in the genus Schizodactylus as well; and they renamed the fossil beast Schizodactylus groeningae. When a species is renamed (“synonymized”) in this way, that means that the earlier genus name, Brauckmannia, can never be used again. Heads, S. W. and L. Leuzinger. 2011. On the placement of the Cretaceous orthopteran Brauckmannia groeningae from Brazil, with notes on the relationships of Schizodactylidae (Orthoptera, Ensifera). ZooKeys 77:17-30. Liu, J., M. Steiner, J. A. Dunlop, H. Keupp, D. Shu, Q. Ou, J. Han, Z. Zhang, and X. Zhang. 2011. An armoured Cambrian lobopodian from China with arthopod-like appendiges. Nature 470:526-530. This entry was written by whyevolutionistrue and posted on February 24, 2011 at 6:56 am and filed under evolution. Bookmark the permalink. Follow any comments here with the RSS feed for this post. Both comments and trackbacks are currently closed. Question – if the ancient cricket is placed in the same genus as the modern one that lives in desert locations, & the same rock formations where the ancient Schizodactylus was found contain mayflies, were they contemporary? Mayflies mean reasonably slow flowing water, & yet the crickets suggest sand or dunes? Oops, I forgot to add the link (that’s now done). It is indeed an open access journal. Thx. I love the new nerdy cat picture icon thingy! How wide of a time span does the cricket & mayfly fossil deposit cover? I expect relatively wet periods, with lots of rivers suitable for mayflies, could alternate with relatively dry periods, with lots of dunes suitable for weird crickets, over a time frame of thousands to tens of thousands of years. Those crickets are weird, and it looks like Dr. Coyne was not the first person to be struck by their oddness – I like the species name of the living example “inexpectatus“. The second cricket fossil looks like Kermit waving his arms that way he does. Interesting stuff! I would take issue, though, with the characterization of ZooKeys as an “obscure” journal. It’s only obscure if you’re not a Systematist. Did early aquatic arthropods breathe using the same ‘technology’ ? Did this animal have gills ? If so, where are they in the reconstruction illustration ? More generally did all multicellular aquatic animals from this era use gills or are there other ways of extracting oxygen from water ? Why is the sclerotin on the limbs shaped into bumps ? Perhaps to imitate aquatic vegetation ? Increased armour ? Would it be able to obtain enough oxygen through diffusion as it has a complex surface & is thin & perhaps had a low density of organic matter? This is an aquatic, armoured, worm with pods & it’s a type of lobopod. It has a ‘nozzle’ on the front & it ‘vacuums’ up the debris from the sea bottom & processes it through its simple straight gut. The pods do not APPEAR to be differentiated in the Swiss-army-knife-fashion of the later arthropods & so I’m assuming that there might be attachments to the pods that have not fossilised. I’m guessing that it had gill fronds where the pods join the tube body because diffusion would not permit sufficient oxygen throughput to fuel locomotion. Also movement would increase the amount of waste products ~ this creature would need to excrete a large amount of toxic ammonia & it is too long to do this down the gut. I understand that in modern aquatic arthropods the gills are generally considered to be the main route of ammonia excretion. I wonder what the four pairs of front pods were used for ? They don’t look like they were for grasping. Maybe to clear surface debris for the nozzle ? Your statement about synomization removing the previous genus from available names is correct only if the type species is moved to another genus. I take it this is the situation under discussion. Dr Coyne, isn’t the velvet worm supposed to be related not just to the common ancestor of Arthropoda and Crustacea, but also the common ancestor of those with Chordata? In other words, the great grandfather of humans and flies? First, crustaceans are arthropods. Second, onychophorans are very clearly ecdysozoan protostomes closely related to arthropods. The common ancestor of humans and flies is the common ancestor of all deuterostomes and all protostomes, the “urbilaterian”. Whatever it was, it was nothing like a velvet worm. That drawing of the Diania cactiformis fossils look echinoderm like. so in that sense, yeah. I think I know what Glaisne is referring to, and I’m guessing crinoids. Is that kinda what you were thinking of Glaisne? check out how the segments are arranged in the lobopod, vs. how they are in the crinoid (which is in this case, a feather star). 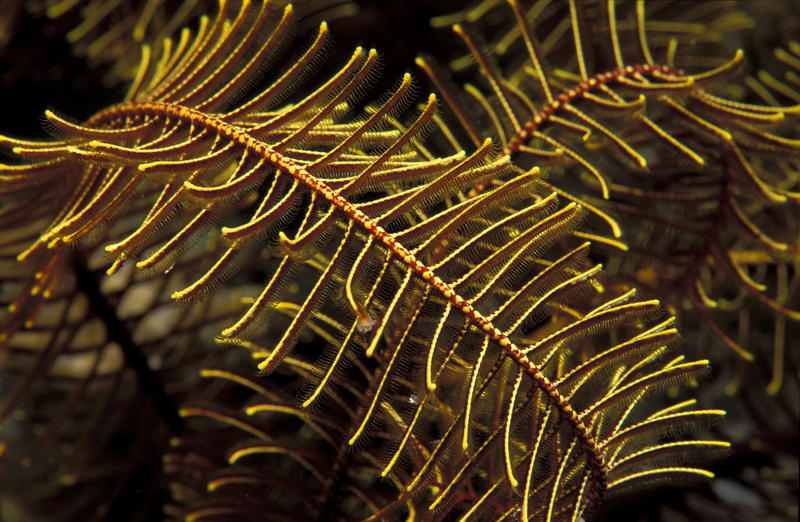 you see how the limbs on the lobopod are directly opposite each other, while in the crinoid, they are a bit offset? you’ll find a similar pattern in all crinoids. the bilaterally symmetrical segmentation in the lobopod puts it outside the echinoderms in my book, but things change fast in the world of the early and pre cambrian these days. I was actually thinking of bristle stars when looking at the drawing. I admit it was just a superficial first impression kind of thing not based on actual details of anatomy. Have I seen post at AlterNet? That mayfly is a thing of beauty. I want the T shirt. Diania; which end is the front? The left is the proboscis the right the posterior according to the article. Sorry I see Michael beat me to it!